Wow. 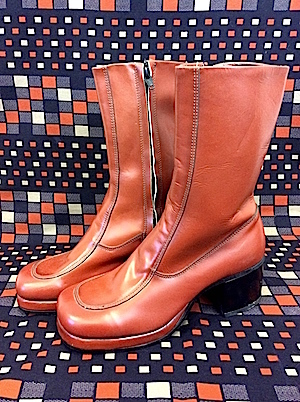 Vintage 70's men's platform BOOTS! Made by Pierre Manden "custom grade". 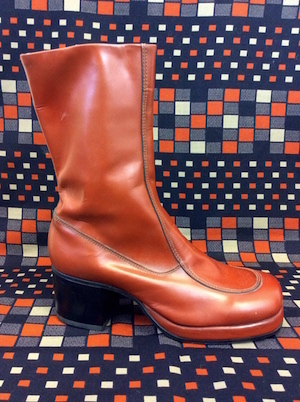 Amber leather (kind of a reddish brown) with a 2.5" platform. Inside nylon zipper. Stitching and detailing around the top- over the toe. 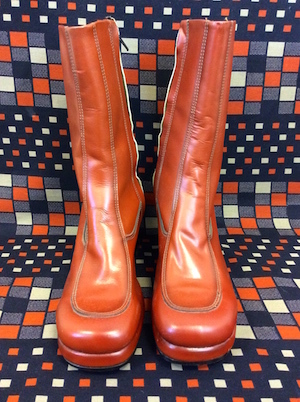 Front platform is covered in matching leather- the huge heel is hard- (maybe black plastic?) with a hard plastic but textured (with the words neolite) heel. The heel is nailed on with tiny copper nails. Smooth leather sole with 2 nails up the instep. Nice shiny leather- feels supple. AWESOME disco shoes! Condition: Excellent never worn. Something in the liner is disintegrating creating a fabric "dust" that will get all over your socks. Doesnt affect the integrity of the boot though. Measures" about 9.5" inside toe to heel. But it was tough to get my hand in there so this could be off a bit. Height: from the bottom of the foot (not the heel): 9"
Around the top (calf opening): about 10"
Shoes are final sale- no returns. 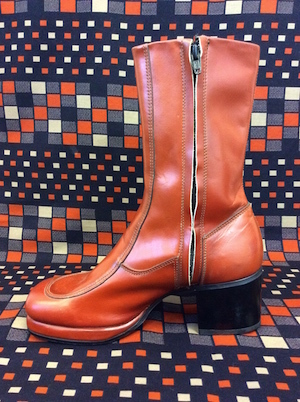 We recommend you get vintage shoes re-soled or re-glued.